Every profession has truths that it is unlikely to admit in pleasant company. Here are 10 facts that you should know, but you probably won’t be told. Juries often give lesser awards to less attractive people. Just like anyone else, jurors are often shallow and can be less generous to those they consider to be unattractive. This ‘halo effect’ is real. It is the tendency for people to view attractive people more favorably than those that are less attractive. Attractive people are often considered to be more intelligent, hardworking, and deserving of a greater financial award. Being unemployed is viewed negatively. If you’re currently not working, many jurors are likely to jump to the conclusion that you’re trying to pull a fast one. It can be especially challenging if you were unemployed when your injury happened. Even if your unemployment began after your injury, it can still be viewed negatively. Jurors tend to like people that continue to try to work. Even if the new job pays poorly, jurors respect the effort. Some jurors are prejudiced against some ethnic backgrounds. Some jurors believe that certain ethnic groups are more likely to lie or to exaggerate their pain, suffering, and disability. Your credibility is perhaps the most important thing in a courtroom. If a couple of jurors think you’re less than honest, it can affect the outcome. Overweight people can be viewed in a negative light by jurors. American society is prejudiced against overweight people. These notions often find their way into the court room. Jurors tend to be less sympathetic to plaintiffs that are viewed as overweight. They are often viewed as lazy and lacking self-control. If the jury doesn’t like you, it will affect your award. Your likeability has a huge impact on your case. Even the most clear-cut case showing gross negligence and serious injury can be challenging with a plaintiff that is unlikable. Jurors enjoy giving money to those they like. They can be disgruntled when comes to awarding money to those they do not like. Your case may be given to another firm. This is often the case with those law firms seen in national TV commercials. In many cases, that’s not really a law firm; it’s a referral service selling your contact information to a legitimate law firm. So the person you first speak to often has no connection to the firm that ultimately takes your case. You may never speak to your attorney again after the first meeting. These ‘attorney mills’ often have a single attorney that takes care of all the initial meetings, but then your case is turned over to a case manager, secretary, or other legal assistant. Our firm has never gone to court. 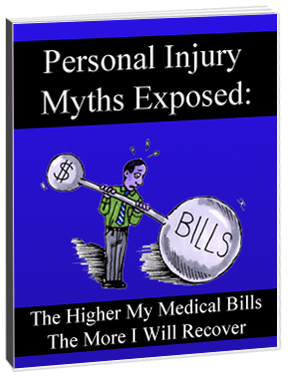 Many personal injury law firms are only interested in settlements. They will never take a case to court. There is a lot of expense involved in preparing adequately to try a case. Many law firms want the quick, cheap money. Insurance companies quickly learn which lawyers are unwilling to pursue a case in court. This can hurt you. It’s possible you don’t even need a lawyer. If the negligence is obvious, and your injuries are severe, you might do better on your own. In many of these instances, the insurance company is willing to give you the maximum amount covered by the policy. In most cases due to the complexities of the law a competent personal injury lawyer is a must. The fees are negotiable. If your case seems like an easy win, you might very well be able to negotiate a lower rate. There is a lot of money at stake. Don’t be afraid to bring up the issue. Negotiating can be the best money you’ve ever made. Every industry has its secrets. These are a few of the ‘secrets’ found within the area of personal injury. Being aware of them will help you to make better decisions. For more on personal injury related topics please visit the firm’s blog here.